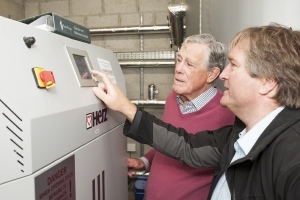 Act now to benefit from biomass boilers — Peter Solly. Changes in the structure of the Renewable Heat Incentive highlight opportunities for bigger boilers in the building services sector, believes Peter Solly of Forest Fuels. Installations of small-scale biomass boilers have continuously reached target levels recently, triggering reductions in the Renewable Heat Incentive for boilers below 200 kW. However, the incentives for medium-scale boilers – between 200 and 999 kW – have remained unchanged. Despite these reductions, there are huge opportunities for organisations such as schools, hospitals, hotels and manufacturing businesses to make the most of the Renewable Heat Incentive — but it is imperative that they choose the correct size and specification of boiler. In recent years some organisations have designed their scheme and the size of their boiler in a way that is not the best, simply in order to maximise the RHI income. With these changes to tariff rates, the payment rates for boilers between 200 and 999 kW are now higher per kWh than for smaller boilers, which once again favours correct and robust scheme design. While the tariff for smaller boilers has dropped, the rate for boilers of 200 kW and more has remained unchanged for some time, which makes them increasingly attractive. However, this is not simply about a higher RHI rate – bigger boilers are typically much more suited to an organisation’s exact heat requirements, and the current RHI rates allow this to happen. Organisations that are still using oil or LPG boilers should act quickly if they wish to make the most of the financial benefits that biomass can offer, because any delay now could cost them severely in the future. There is also a feeling in the renewable heat industry that although 200 kW+ boilers are the most beneficial size for many organisations, the strong financial incentive may not be around for too much longer. Sam Whatmore of Forest Fuels (right) explains the finer points of Merthen Manor’s wood chip boiler to owner Tony Vyvyan. It serves a district-heating system for the manor house, barn and six cottages and saves £20 000 a year compared to the old oil and LPG boilers. After the Government has completed its comprehensive spending review in November it is likely that there will be a limited amount, or even nothing, left for new entrants in the Renewable Heat Incentive budget from April 2016 onwards. This means that organisations need to get involved now to ensure that they don’t miss the boat. Once accredited onto the scheme, organisations are guaranteed 20 years of payments; it is only new entrants onto the scheme who are affected by cuts in rates. In short, there is no benefit in waiting when it comes to the RHI. Biomass installations will not get cheaper, and RHI payments will only decrease or disappear. In recent months, some have put their biomass plans on hold because of a dip in the price of LPG or oil, but this is a very short term view to take. I would encourage organisations to take a much more long-term approach, because the reality is that a dip in fossil-fuel prices is only temporary. Over a number of years the price will inevitably continue to increase. On the flip side, sustainable local wood fuel is not subject to the same volatile markets. It has a well-established reliable supply chain with a strong degree of price stability, which means that organisations can predictably forecast their energy bills well into the future. Price stability is perhaps the key reason for getting on board now. Any outfit that has a biomass system installed in before April 2016 is guaranteed to receive RHI income for the next 20 years. Leave that installation until mid 2016, and that opportunity could well be gone. Organisations must think long-term financially, not in 2-year cycles, when it comes to managing their future heating bills. While I am confident that biomass is the right solution for many organisations, I must offer a note of caution about how they should go about it. 1. Act quickly and think long term! The strong financial incentive may only be around until April 2016, and any biomass system installed before April 2016 is guaranteed to receive RHI income for the next 20 years. Don’t miss the boat! Too many organisations get to the point of having their boiler installed before realising that the system doesn’t match their precise requirements. An independent specialist will carry out in-depth planning by analysing your heating needs, specify the exact configuration of boiler and help you find the right installer of the job. This will ensure that, for example, the district heat main maintains a high level of efficiency and that there is a robust design for fuel storage and delivery. The most important factors for choosing a wood-fuel supplier are quality of wood fuel, reliability, timely deliveries, adaptability, and being on the Biomass Suppliers List (BSL). A wood-fuel supplier must be willing to adapt to your changing needs and sort out any issues immediately, while the best suppliers will routinely advise if you have any other biomass queries. Although RHI tariffs may sway you to look at a system that could potentially earn you the most money, always choose a system that is best suited to your site, as this will save money and potential maintenance costs in the future. Large, bespoke, biomass boilers are by far the most cost-effective solution, but they are also much more complex and more likely to result in problems if you get it wrong. For those organisations looking to have biomass installed, I’d urge them to get a well-respected biomass consultant on-board from day one, so that they can specify the most appropriate system for their needs — one that generates them the best return on investment and avoids any potential hold ups or problems. Many installers aren’t experienced in larger systems, so it’s all too easy for them to get the system design and configuration wrong from the outset. Bigger scale’ means mistakes can be more costly, so getting it right from the outset can save huge amounts of money. It’s also surprising the number of organisations that had a biomass system installed after July 2009 that have so far failed to get them registered for payments. Although this was before the RHI came out, boilers commissioned after this date should be eligible for the RHI payments. This is a huge opportunity, and it’s a shame that organisations are missing it. Although there are hurdles — the application can be complex, and additional works may be required — the benefits are likely to outweigh these. For difficult situations, or where public funding has been received for the initial installation, I’d suggest that they speak to a biomass specialist as soon as possible to help with registration, emissions testing and other sticking points. Because the system gets the RHI rate at the time of application, not the time of installation, if they leave it much longer they will either receive much lower RHI payments or non at all. One good example of an organisation in a similar situation is St Leger Homes in Doncaster. They had received a grant to help fund their biomass boiler, and we helped guide them through the maze of paying this back while maximising the gains of RHI payments. But what if you don’t have the upfront capital? It is still possible to benefit from the price-stability of a biomass boiler without the initial funding by working with an ESCO (Energy Service Company) An ESCO will install your boiler for free, maintain it, and then simply charge you for the fuel. Others can sell heat by the kWh, and in return they receive RHI payments. This means that the customer takes neither the design risk nor the operational risk of running the boiler system. In short, they receive all of the benefits of low-cost, low-carbon wood fuel without any of the hassle. The Croft School in Stratford-Upon-Avon has recently secured its energy future by doing this, and many others are now following suit. For organisations looking to lower their heating bills and CO2 emissions at the same time, I offer one final piece of advice. Don’t wait until it’s too late. Get on the escalator now, lock in your biomass boiler at the best possible RHI rate, and ensure that your organisation benefits for many years to come. Peter Solly is managing director of Forest Fuels.